This has been the summer of ice cream for me. As a friend recently pointed out (in an observational way, not a judgmental one, in case you were wondering) I’ve been eating lots of it. Maybe it’s because my boyfriend’s been flaneuring around Europe without me (flaneur, for the record, is a noun, not a verb, but I use it as both. My blog, my rules.) and I’ve been emotionally eating in his absence. Or maybe it’s because what the hell else should I do during a beachless, vacationless summer in the city? Ice cream is IT. Yesterday I even waited in line for it. A pretty long line too, about 35 minutes total, spent between a pack of NYU freshmen and a couple of whiny women straight from a midtown office. So why would I deal with that when there are somewhere around 5 billion other places to get ice cream in this city? Cause it was from the Big Gay Ice Cream Truck! I’ve been tracking the truck (which constantly changes location) for a few weeks now, missing it because of conflicting work schedules, being out of town (the truck, not me) and friends who didn’t want to wait in line for ice cream. But everything fell into place yesterday and I was able to get my ice cream, in all its delicious, big, gay glory! Anytime that you break through chocolate and there's dulce de leche oozing out from below, THAT's a good thing. Choosing wasn’t easy but I couldn’t pass up the opportunity to walk up and ask for a Salty Pimp so that’s what I had. 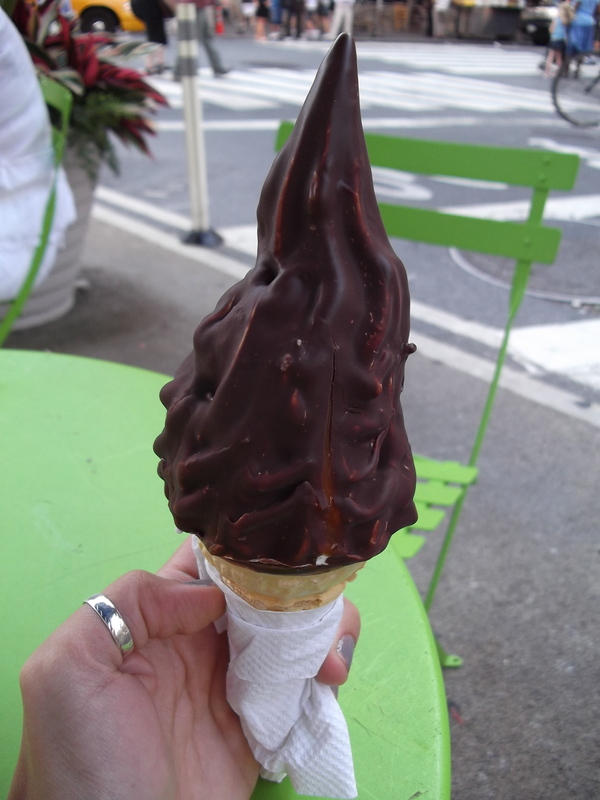 (Only in New York can you do do this, go to a big gay ice cream truck and order a salty pimp. What would my mom think?) But really, beyond just the silly name, the Salty Pimp sounded good. And when I finally held it in my hand and bit into it, it WAS good. Sooo good! 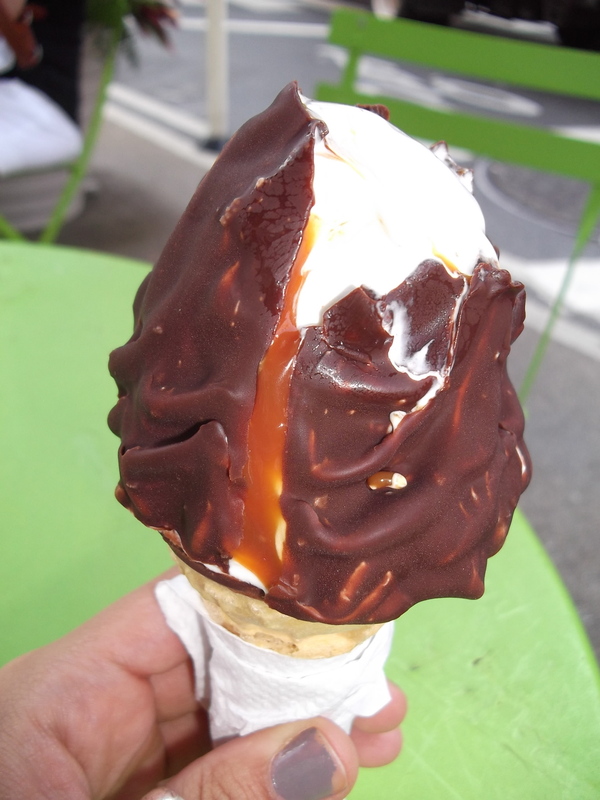 A crispy, wafer-like cone was filled and topped high with creamy, thick vanilla ice cream, swirled with ribbons of rich, sticky dulce de leche, dipped in a chocolate shell and finally sprinkled with coarse sea salt. After the initial light snap of the chocolate shell, the cold, smooth vanilla ice cream peeked out with swirls of orangey dulce de leche adding a tangy, buttery sweetness. The subtle savory hint from the salt crystals was just the perfect bit of contrast to play up the sweetness. I mean, seriously, how could it be anything but the summer of ice cream? This entry was posted in Sweet stuff and tagged Big Gay Ice Cream, dulce de leche, food truck, ice cream, salt. Bookmark the permalink. i hate reading your blog when i cant eat things like Salty Pimps. its just cruel.